POSITIVO ESPRESSO: Rainbow Bridge by Bicycle - to the Future Site of the 2020 Games? Rainbow Bridge by Bicycle - to the Future Site of the 2020 Games? I have been by bicycle to Ariake many times -- usually to a PV Expo / WSEW or other similar event, or some kind of weekend excursion. Before I always went via Tsukiji. This weekend, I went for the first time via the Rainbow Bridge. Why had I not tried it before? Well, you must WALK your bicycle across the 1.6 km length of the bridge -- about a mile. 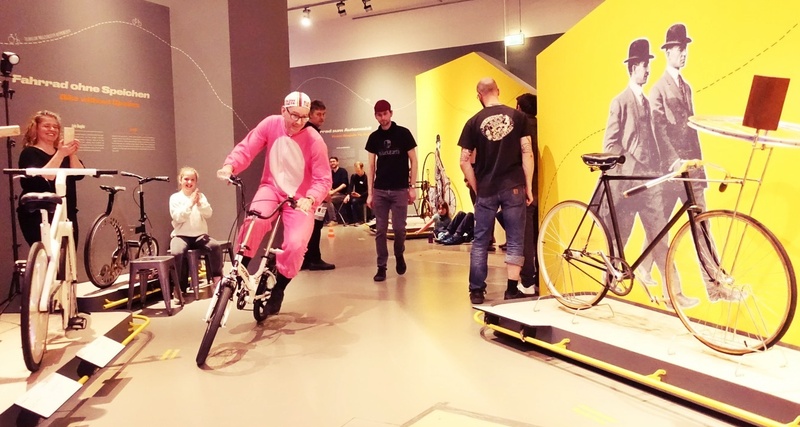 And to enforce this edict, each bike's rear wheel is to be placed on a kind of dolly. The Renovo looked like one of those aging dogs that can no longer use its hind legs but still wants to to for a walk with its owner, rear in a sling with wheels. 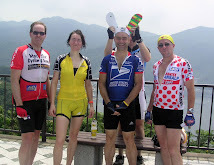 Still, at least there was an elevator for a record breaking (if it were, say, a Strava segment) fast 100m+ ascent to the bridge level on the Tokyo side. And there were some impressive views of Tokyo's infrastructure. The working side of the city. The return trip was on 2 wheels via Tsukiji! I hope they improve this access by 2020 ... in time for the Olympics. 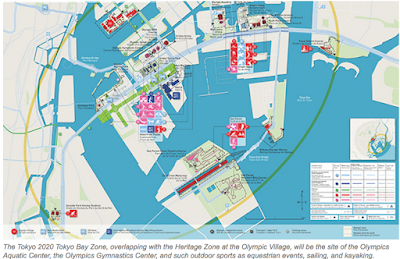 April 5, 2016 Update: See comments below, as well as a diagram of Tokyo 2020 venues in Odaiba/Ariake and the rest of the "Bay Zone" and recent Google Maps images below ... at least they are adding a second bridge just south of Tsukiji that will go through to the Kachidoki/Tsukishima southern edge and then on to Ariake (the latter span looks ready to open any day) ... but that is still quite far from the Odaiba venues. I wonder WHY they are adding a JR stop between Shinagawa and Tamachi in time for the games ... unless they plan ferry shuttles, or plan to open up the Rainbow Bridge to foot/bicycle traffic? Otherwise there is not really any place to go from such a train stop. Admittedly, I have not followed this planning process closely, and my curiousity was a result of the ride this Saturday ... so let me know if I am missing something. 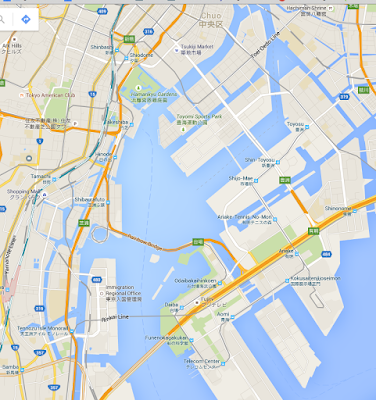 You can see a grey line where the bridge is being added between Hamarikyu Gardens and Tsukiji ... through to Ariake. Not ideal for someone heading from Shinagawa (or Meguro or Setagaya or Shibuya or Azabu or Kawasaki) to Odaiba. I wouldn't put up any hopes for regular bicycle access in the future. There sidewalk is very narrow and has quite some corners with bad visibility, plus the hand rail on the Odaiba side is too low to stop a cyclist from falling over. Unless some serious remodeling is happening, I doubt anyone would want to assume the risk of accidents there. And what a shame they had no sense when they built it, and the many other bridges with low railings. I worked near Shinagawa, and came from the Shinkiba side, but had to go through Ginza, Tsukiji and all that nonsense. 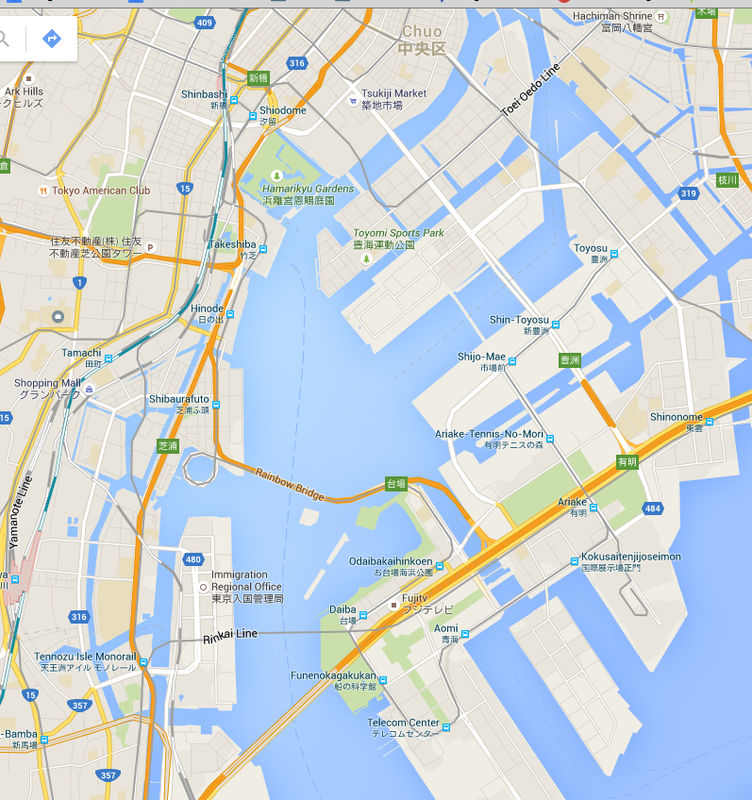 Yes, it is an obvious failure of Japanese / Tokyo area planning from the not too distant past. I guess if they had planned and built it 10 years later they would have do it differently. Still, I am amazed that Tokyo does manage to keep gradually improving its infrastructure, adding a train line here, a new station there. And at least it looks like the access from Tsukiji / Ginza area will improve somewhat, and the Olympic Village at least will be North of the Rainbow Bridge ... though many of the venues will be off the eastern ramp of the bridge. I added one diagram I could find several places online at the bottom of the post. As I understand it, they will be using a lot of shuttle buses for the Olympics, particularly for the venues out beyond Odaiba in Tokyo Bay. The new Yamanote line station at Sengakuji is an absolute winner for those of us who live in ….Sengakuji.